Thinking of getting a dog? 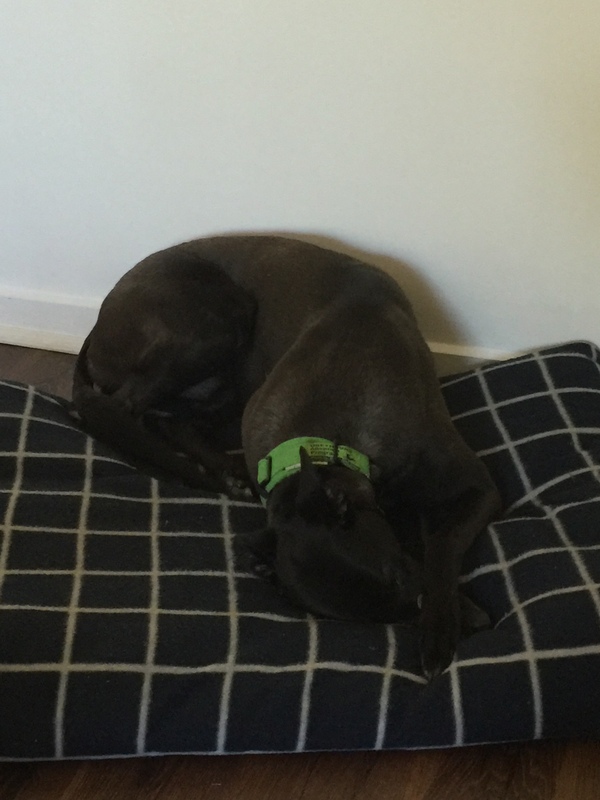 Lead a busy life and need the company of a pet that is laid back, loving and docile? Perhaps you should consider adopting a greyhound. 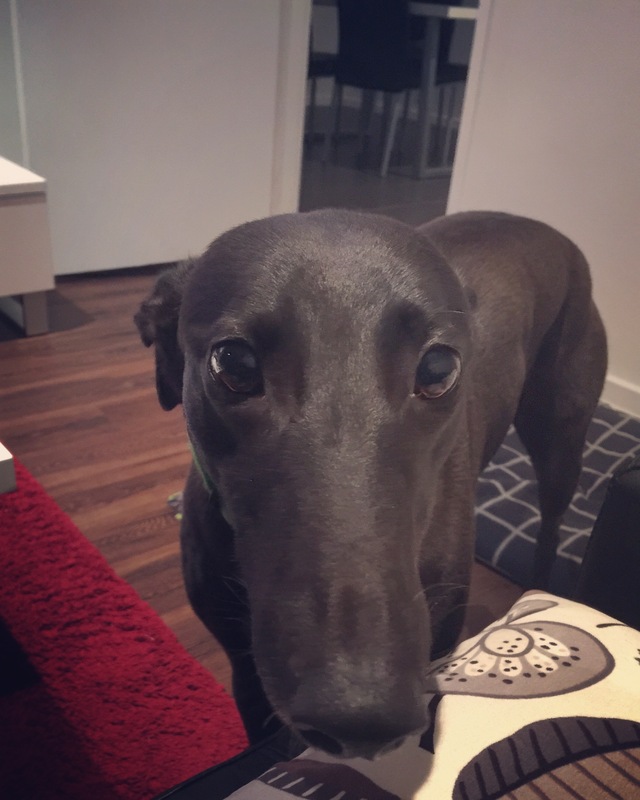 Last September, my wife and I decided to adopt our grey, Ruby, from GAP (Greyhound Adoption Program) based in Seymour. 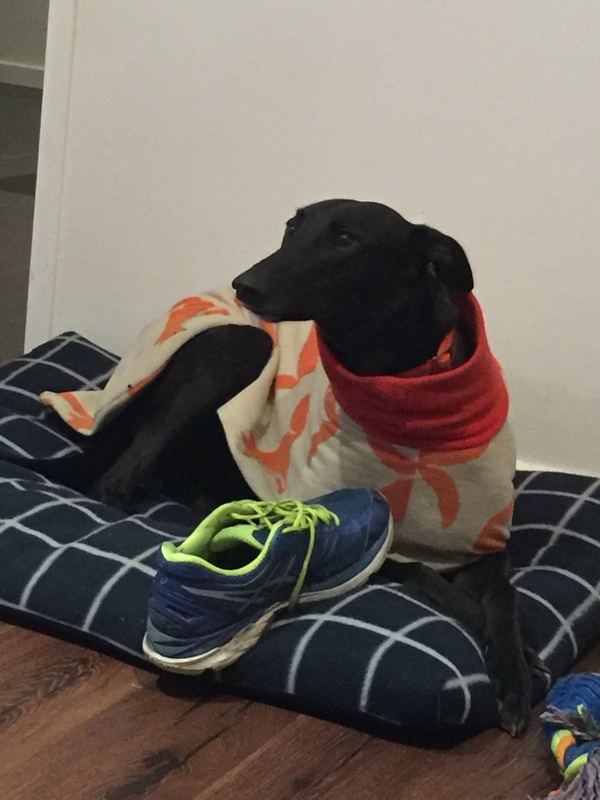 The program is an excellent initiative that works tirelessly to find a home for ex racing dogs. We are happy to say that the newest member of our family is wonderful. Like many potential dog owners out there, we did not know much about greyhounds. When researching particular traits of dog breed, we were surprised at what we found. In fact, we basically believed greyhounds to be the very opposite of what they are. Beforehand, we thought of greyhounds as a breed with boundless energy requiring a large space and constant stimulation. Given the fact that they are racing dogs, we also had misconceptions about their temperament and nature. It was not until we read more about them that we seriously considered one for a pet, and we are glad that we did. No seriously. They are bloody lazy. One walk around the block and they are done for the day. You will recover before they do. Need a television buddy? A grey will be happy to lay there with you all day. Sometimes they can be so still you feel like you need to check their pulse. After maybe five minutes of excitement, greyhounds are happy to settle into their spot. Now I must emphasise this: THEIR spot. They are very territorial dogs, so think carefully before giving your dog the bed to sleep on. You’ll lose it forever. And beware, they are kleptomaniacs. So if you have a messy husband/child/wife etc. they will quickly learn to pick up their stuff or it will end up in the greyhound’s bed. Don’t worry, they never actually do anything to it, but for some reason they like to collect. Also, they sometimes like to lay like this, which is hilarious. 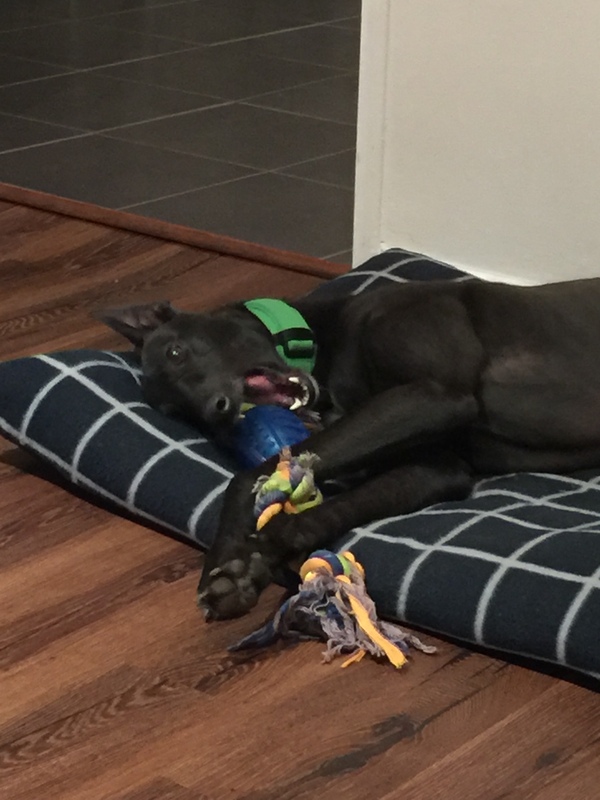 Greyhounds are fast learners, or at least that’s what we have discovered. It did not take long for Ruby to figure out her space and routine. 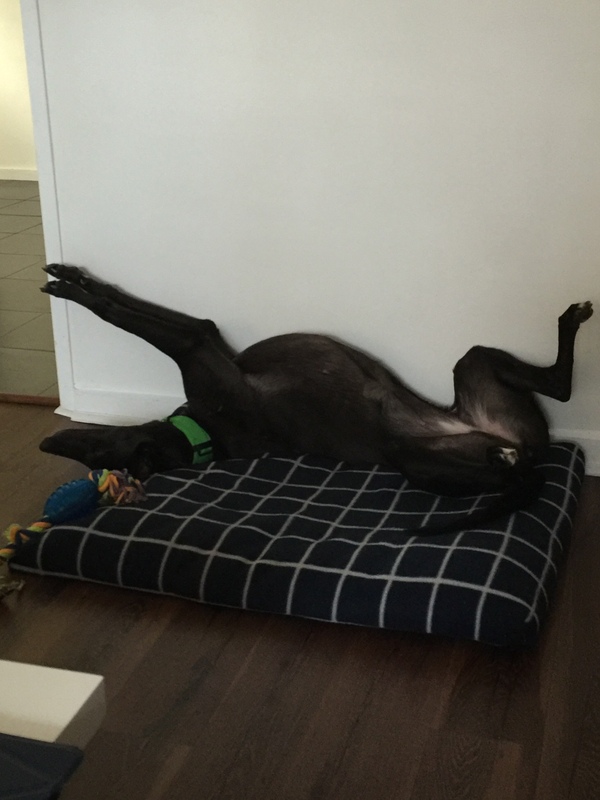 If your lifestyle is routine based and very structured, a greyhound will fit your home perfectly. But remember, with intelligence comes awareness, so like a petulant child, they will occasionally test you. Beware puppy dog eyes when you ask them to go outside. You could say this about any number of dog breeds, but greyhounds are an incredibly gentle breed and they are often great around young children. Given that many of them have a racing background, they are well socialised around humans and are generally not shy around strangers. 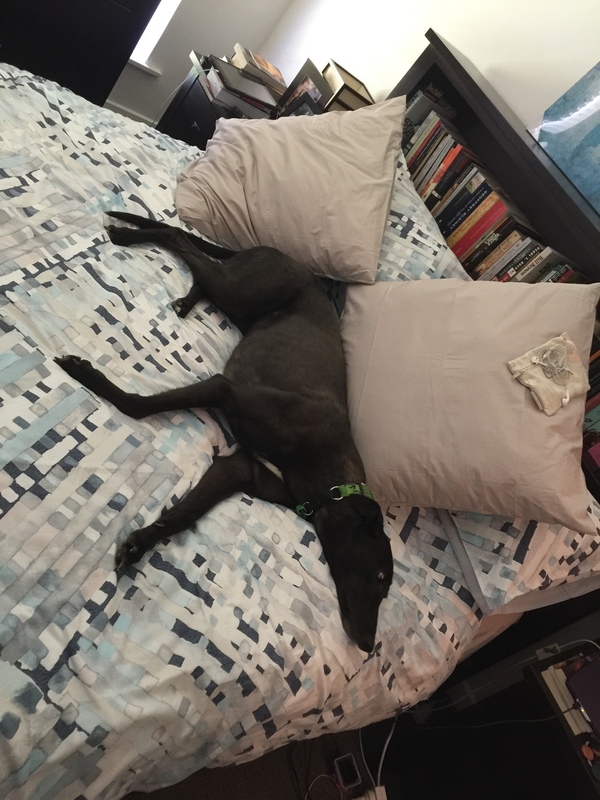 Growing up surrounded by people and other racing dogs, greys usually have no problem being around other dogs. Although as with any dog, there are variables. When it comes to cats, GAP will tell you if they are cat friendly or not. 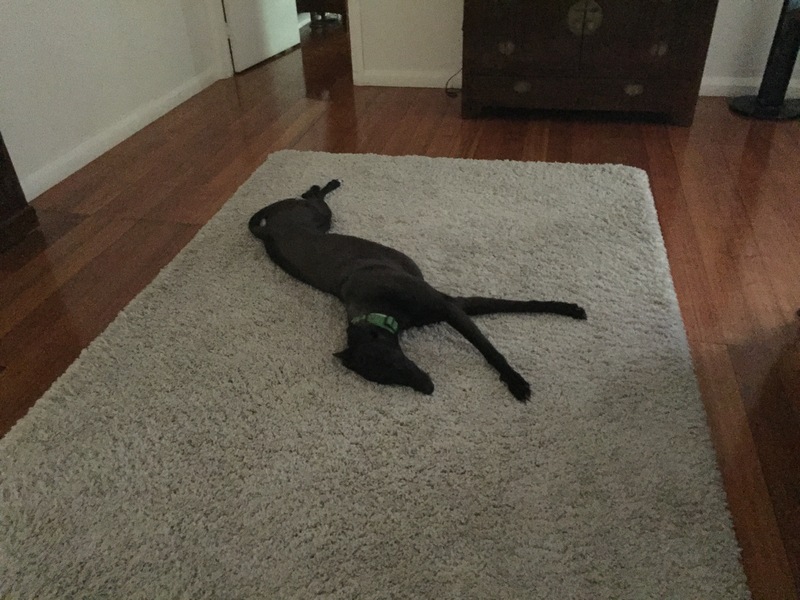 Each greyhound is tested prior to adoption to gauge their compatibility with cats. In Ruby’s case, she’s scared of them, so no problems there. Bred for racing, greyhounds generally have few recurring health issues. They also don’t shed much hair, which is a real bonus considering they will lay anywhere they choose in your house. 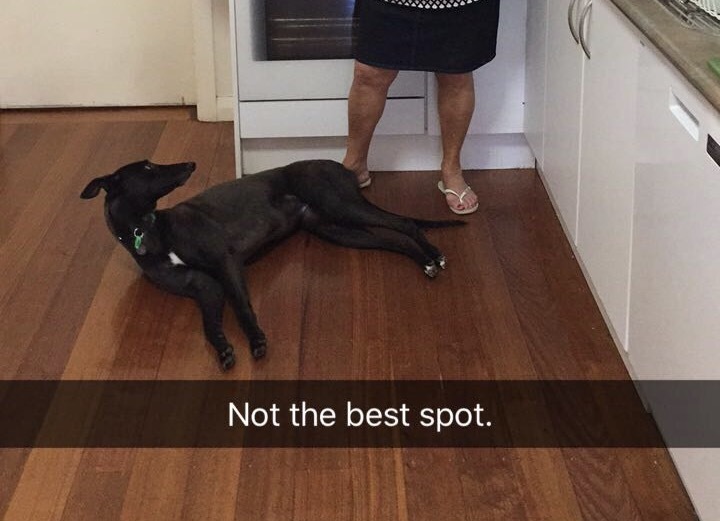 Trust me, if you’re in the kitchen preparing dinner, you can bet your greyhound will lay right in the middle. There are an increasing number of greyhounds that need a loving home. The GAP adoption process is simple and easy and they are happy to help you with everything you may need. Not only will you be getting a great dog to add to your family, but you will be doing a very ethical thing. Of course, as with any dog breed, do your research. If you want a dog to let off the leash and send running every evening, then a greyhound is not ideal. Laws obligate owners to make sure that greyhounds are kept on their leash in public at all times, more for their own protection than anything else. But if you are on the search for an easy going, loving, affectionate and funny dog, consider a greyhound. Trust me, they will be grateful to have you, and you them. Oh yes…very good!….very sloppy and wet my dear….hmmmmm…is that a drop of nugget I see on the rim?…hmmmm…..let me…..let me just have a little taste before the sniff my darling…….hmmmmm….hmm..yes….that is a delicate bit of chocolate my dear….ah yes….let me guess…curry for dinner?….oh quite right I am….aren’t I?….ok….time for sniff…..sssssnnnnnnniiiiiiiiffffffff…..hmmm…hhhmmmmm I see…yes….yes indeed as well curry……hmmm….that fragrance is quite noticeable….yes…..onion and garlic chutney I take it my dear?…..hmmmmm….yes quite….. I kissed a pizza and i liked it , the taste of its tomato sauce yeah. I kissed a pizza just to try it, it doesnt mean that im pizzasexual tho.